Go to town on a gooey hunk of brie with this stoneware design that keeps baked cheese melty. Hungry? Hosting? Had a long day? Brie is a solid choice, or in this case, a melty one. 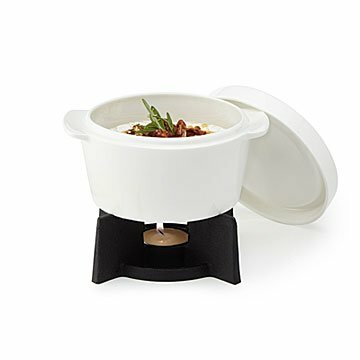 Our stoneware design keeps your favorite cheese melty. The hero of the operation: a humble little tealight. Place a hunk of baked brie in the dish, add scrumptious toppings like honey or preserves, light a candle, and let it do its thing. Grab a piece of crusty bread and get in there, friends. And to answer that voice in the back of your head: Yes! All cheeses are welcome at this party (looking at you cheddar, gouda, and gruyere). Use it to also make nachos, creamy mac, or your own creative combination because frankly, there's no losing here. Made in China. Ceramic dish is dishwasher, microwave and oven safe. Never leave a lit tea light unattended. Adult supervision if children are around. This baker does a lovely job of melting a small (4.5") wheel of cheese. We used Brie, the instructions suggested camembert as well. Unfortunately, we were not warned to keep stirring, so the center 1" burned black and stuck. The rest of the cheese melted into a gooey, delicious mass, perfect for water biscuits and apricot jam. Yummy! Perhaps next time we'll put a few layers of foil between the candle and the outer bottom of the dish. Since it was a Xmas gift, it has not yet been used, but it seems to be a really nice item to have for guests when serving warmed cheeses. I both it for my step-mother along with the ampersand cheese and cracker board, which is also really nice. I got it as a gift for my aunt who loves to entertain. We always have baked brie at her house and no one likes when it gets cold. Now it won't! It is the perfect size for a wheel of brie too! It was given as a gift. I looked at a few brie bakers and this one was the most simple, straight forward design. I wanted to give something easy to use! The dish is a nice size. Not small, but a good size to have for a couple or a few people. The dish and stand are well made.